PHOTO BY GEREMY BORDONARO/GLEANER NEWS: Pacifico Life’s Bloor Street West location remains boarded up. Landlord Yong Jo gave Tamara Hirsh three hours to move her marijuana dispensary out of the building shortly before Christmas. It was 2 p.m. three days before Christmas when she got the telephone call. Tamara Hirsh was working in the recently opened location of her medical marijuana dispensary when her landlord, Yong Jo, called and told her that the 444 Bloor St. W. storefront had to be vacated by 5 p.m. that afternoon. It was not unexpected, but it was unwelcome. What Hirsh hadn’t expected were the police officers the landlord brought in for “peacekeeping” reasons. 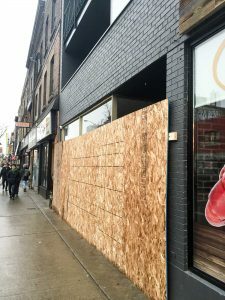 Hirsh said the shutdown of her Toronto storefront means that some of her customers who had found their “tried and true” marijuana product would have to find some place else. Pacifico was one of a number of dispensaries that have been popping up at an increasing rate in the downtown area of Toronto. And the city is powerless to stop the influx, according to Joe Cressy (Ward 20, Trinity-Spadina). Though dispensaries are still illegal, the move towards legalization has created inconsistencies when it comes to enforcing marijuana laws. While this limbo exists it has been left to municipalities — and the dispensaries themselves — to help control the influx and quality of medical marijuana. The Toronto Police Service is called in to deal with them on a case-by-case basis according to Detective Sergeant Brian Kelly of 14 Division, who said­ investigations are primarily complaint driven. Hirsh said she thinks some measures need to be taken in the interim. The city is looking for ways to manage and contain the dispensaries, but without federal regulation it’s a wild frontier. Landlord Yong Jo did not respond to the Gleaner’s requests for an interview.